YUMMY! That’s how I describe this dish! I’ve chopped, sauteed and grilled portobello mushrooms, but this is the 1st time I’ve stuffed them. Talk about filling! I had to look up what a portobello/a mushroom actually was! It’s just a mature common white mushroom. Containing potassium and antioxidants, the common mushroom can reduce your chances of getting breast cancer. Couple that with green tea and reduce your odds even more…well that’s according to Wikipedia. I looked up a recipe or two for stuffed mushrooms and omitted half of the ingredients and added my own. Hope you enjoy! Again another easy and relatively quick recipe that’s great for vegans (omit the cheese) or vegetarians! Before we get started, know that you can omit or add whatever you’d like to this recipe! Preheat oven to 375 degrees Fahrenheit. Add chopped onion, bell peppers, carrots, cumin and basil to pan with 1 tbls of medium-high heated olive oil and saute and stir. Once softened a bit, add garlic and beans (drained). Stir and saute on reduced heat for 5 minutes. Brush some extra virgin olive oil onto the mushrooms and set aside. I placed mine in the cast iron grilling pan I planned to bake them in.The mushrooms will reduce in size so don’t worry of the pan looks a little crowded. On low heat add Parmesan cheese (optional) to your filling mixture and 1/2 cup of shredded cheddar cheese, salt and pepper to taste. Stir and turn off heat. 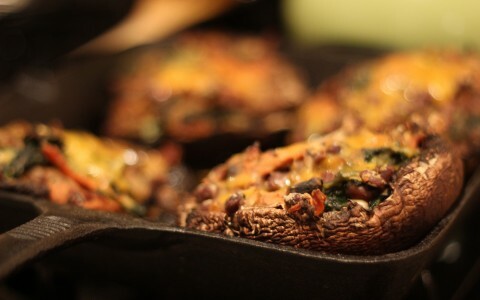 Spoon equal portions of mixture into each mushroom and bake for 20-25 minutes, checking periodically. Sprinkle the last of the cheddar cheese (or a cheese of your choice) on top and bake for an additional 5 minutes. Remove when mushrooms are tender and serve 2 to a person.